THROUGH OUR, EXPERIENCE AND EXPERTISE IN WORKING WITH SME'S AND START-UPS, WE WILL HELP YOUR BRAND GROW AND EXPAND IN THE RIGHT DIRECTION, VIA THE RIGHT PLATFORMS, PEOPLE AND PLACES. TWO INFLUENCE’ HAVE WORKED WITH MANY NATURAL WELLNESS SUPPLEMENTS, EXPERTS AND INDUSTRY PRACTITIONERS AS WELL AS BUILT AND EXTENSIVE NETWORK AMONG THE BOUTIQUE FITNESS SPACE AS WELL AS INDUSTRY LEADING GYMS, CLASSES AND STUDIOS. 4.DELIVER REAL LIFE, AUTHENTIC MOMENTS THROUGH BRAND ADVOCATES AND AMBASSADORS. AS THE UK’S LARGEST PALEO INFLUENCER ‘LONDONPALEOGIRL’, TESSA’S PASSION FOR FOOD AND LIVING THE MODERN DAY PALEO LIFESTYLE IS HIGHLY REGARDED BY ALL IN THE INDUSTRY. FROM WORKING WITH CELEBRITY MASTER CHEF JOHN TORODE, TO BEING AWARDED CHEF OF THE YEAR, TESSA’SPRESENCE AT CELEBRITY EVENTS THROUGH TO HER GUEST APPEARANCES AND PRESENTING ON SHOWS SUCH AS ‘PERFORMANCE KITCHEN’ DEMONSTRATES HER KNOWLEDGE AND COOKING ABILITY. TESSA HAS FEATURED TALKING ABOUT MODERN DAY PALEO IN NUMEROUS PRINT PRESS, SUCH AS LOOK MAGAZINE THE HUFFINGTON POST, ACTED ASA BRAND AMBASADOR TO WORLD RENOWNED BRANDS SUCH AS LORNA JANE AND LIVE!UK AND CREATED RECIPES, CONTENT AND BEEN INTERVIEWD FOR BRANDS SPANNING ACROSS THE FOOD, FITENSS, FASHION AND BEAUTY INDUSTRIES FROM COPE ACTIVE TO DRESSIER. TESSA ENJOYS RE-CREATING UNHEALTHY DISHES TO WHOLESOME, CLEAN DELICIOUS MEALS TO INSPIRE HER AUDIENCE. HER VISION IS TO SHOW LIVING A HEALTHT/BALANCED LIFESTYLE IS ACCESSIBLE TO ALL BY MAKING A FEW SMALL CHANGES. AS A QUALIFIED PERSONAL TRAINER, BECKI HAS BUILT A CREDIBLE REPUTATION WITHIN THE INDUSTRY. 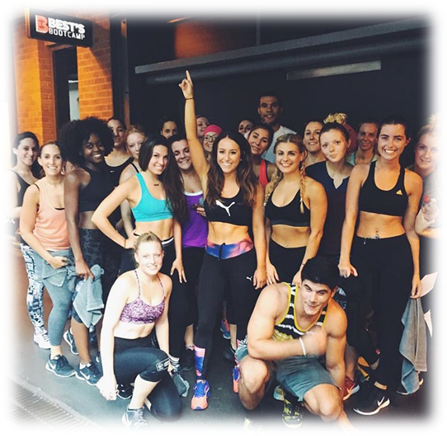 HAVING WORKED WITH LEADING FITNESS CENTRES, APPEARED IN WOMEN’S HEALTH & COSMO, HOSTED BOOTCAMPS AND BEEN BRAND AMBASSADER FOR WORLD RENOWNED BRANDS SUCH AS PUMA, JD WOMEN AND LORNA JANE - TO TRAINING CELEBRITIES, AND INFLUENCERS, BECKI HAS CEMENTED HERSELF FIRMLY AS ONE OF THE INDUSTRIES ELITE. HER DEVOUT LOVE FOR FOOD, FITNESS AND FASHION HAS SEEN HER WORK WITH AN EXTENSIVE PORTFOLIO OF BRANDS, PRODUCTS, AND SERVICES SPANNING ACROSS THE HEALTH, FOOD ,FITNESS, FASHION AND BEAUTY INDUSTRIES ON RECIPE DEVELOPMENT, FASHION STYLE HAULS, INTERVIEWS AND SOCIAL MEDIA TAKEOVERS.